Sunday, Feb. 1 at Tampa, Fla., approx. 3 p.m.
From the ugliness of 1-15 to the beauty of an AFC East title. That’s the Miami Dolphins’ story this season. The tale was nearly as good for the Atlanta Falcons, who went from 4-12 to an NFC wild-card berth. And for the NFC South-winning Carolina Panthers, who surged from 7-9 to 12-4. Minnesota improved by two games to 10-6, and that was good enough for the NFC North crown. While Miami, Carolina and Minnesota were clinching divisions Sunday, the Baltimore Ravens and Philadelphia Eagles were joining the Falcons as wild cards. Already in were the New York Giants and Arizona Cardinals in the NFC, the Tennessee Titans, Pittsburgh Steelers and Indianapolis Colts in the AFC. San Diego completed the playoff field in the final game of the regular season, beating Denver to win the AFC West with an 8-8 record. Next weekend, Atlanta is at Arizona at 1:30 p.m. PST on Saturday and Philadelphia is at Minnesota at 1:30 p.m. on Sunday in the NFC. Indianapolis visits San Diego on Saturday night and Baltimore is at Miami in the 10 a.m. game Sunday in the AFC. The Giants, Panthers, Titans and Steelers have byes. Tennessee will host the first game of the divisional round on Jan. 10 at 1:30 p.m. The night game that Saturday will be at Carolina. On Sunday, Jan. 11, the Giants will be the host for the 10 a.m. game, followed by a 1:45 p.m. kickoff in Pittsburgh. The NFC title game will be a noon kickoff, followed by the AFC championship game at 3:30 p.m. on Jan. 18. The Super Bowl in Tampa, Fla., is scheduled for Feb. 1. 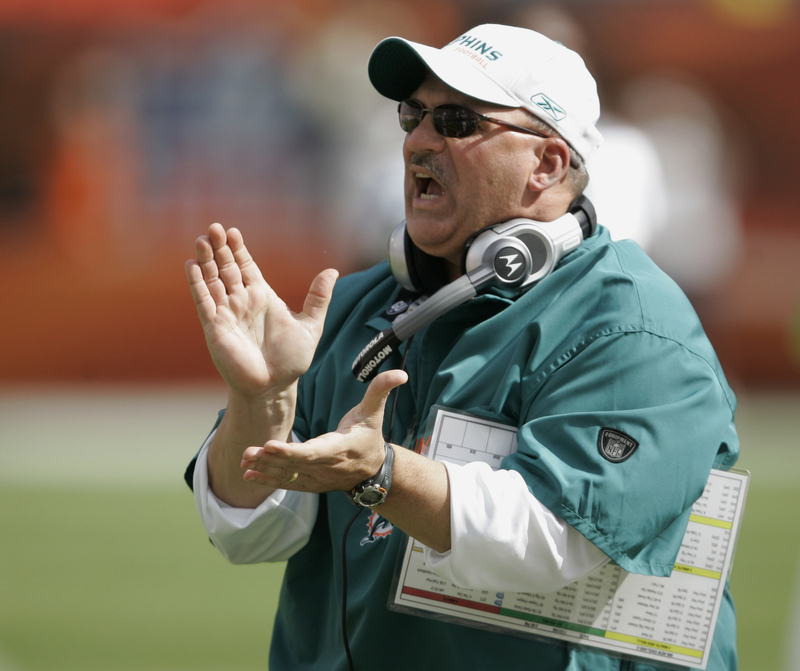 A year after winning once, the Dolphins’ remarkable resurgence under first-year coach Tony Sparano got them 11 victories, including a 24-17 win over the New York Jets that secured the division. Miami joins the 1999 Indianapolis Colts as the only teams to make 10-game improvements. “We’re going to savor this now, at least on the flight home. We’ll start planning for the playoffs tomorrow,” Sparano said. The Dolphins won five straight and nine of 10 to close the season and qualify for the playoffs for the first time in seven seasons. They lost to Baltimore 27-13 in Miami on Oct. 19. The Chargers completed an improbable in-season turnaround with a 52-21 victory against the Broncos. San Diego won its final four games to become the first 8-8 division winner since 1985, and first team ever to go from 4-8 to the playoffs. Denver (8-8) completed a monumental collapse, becoming the first team since division play began in 1967 to miss the playoffs after having a three-game lead with three weeks to go. The Ravens got their wild-card berth by routing Jacksonville 27-7 to finish 11-5 behind NFC North winner Pittsburgh. New England also finished 11-5, becoming the first team with that many wins to miss the playoffs since Denver in 1985. The Patriots, of course, were undefeated through last season until falling to the Giants in the Super Bowl. Carolina needed John Kasay’s 42-yard field goal with a second left to beat New Orleans 33-31 and hold off Atlanta in the NFC South. The Panthers had the same record as the Giants, but lost at New York in overtime last week and get the No. 2 seed. The Giants lost 20-19 at Minnesota, which was enough for the Vikings to get the NFC North crown. Ryan Longwell’s 50-yard field goal as time expired gave Minnesota its first division title since 2000. But with Chicago losing 31-24 at Houston, the Vikings would have qualified even if they lost to the Giants. “It wouldn’t have felt the same if we won the division by default,” Pro Bowl left guard Steve Hutchinson said. Atlanta has gone from the incarceration of its franchise quarterback, Michael Vick, and the resignation of its coach, Bobby Petrino, after 13 games last year to a legitimate shot at the Super Bowl. Philadelphia was the biggest surprise qualifier. The Eagles had the toughest road, needing Tampa Bay and Chicago to lose, which both did. Then they had to beat Dallas. By the second quarter, the rout was on at Philly. The 44-6 romp lifted the Eagles to 9-6-1 for the final wild card, eliminating the Cowboys. “A lot of people counted us out and said it was over,” Donovan McNabb said. “We continued to stay focused on what the plan was. We knew we had to come out and play a tough team that was hungry, just like we were.